S/S Wed. July 25. Offers Accepted July 30th. This 1856sf 2 storey in River Heights has been stylishly updated over the years and is sure to impress. The main floor of this home features a partially open concepts layout, and is perfect for families, or for entertaining. Gorgeous windows in a back all season “sunroom” offer lovely views of this well kept yard. In 2015 a custom kitchen was installed with gleaming white cupboards and quartz counter tops. The home has three spacious bedrooms on the upper level, one bedroom features a separate den space which could be the perfect playroom, or great for a shared bedroom for children. The master features a walk in closet and a huge ensuite! Upstairs you will also find a fully refreshed main bathroom with heated floors. Other upgrades include new shingles (2017), HE Furnace (2010), HWT (2010), new doors (side, front and patio 2014), some new windows (2014) and more! 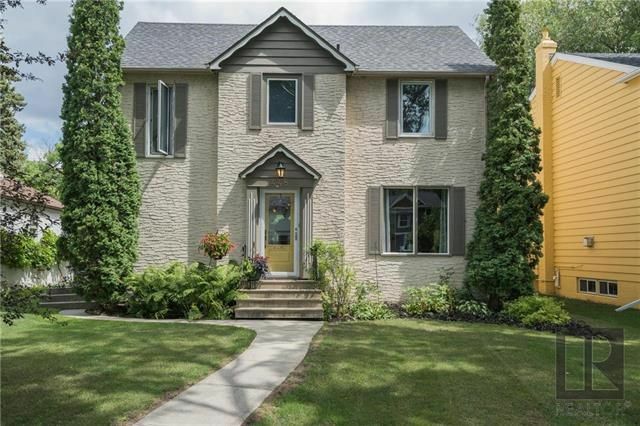 Located in one of Winnipeg’s best neighbourhoods, close to all amenities and great schools!